I am super excited to announce that my Back To School/University series is back! 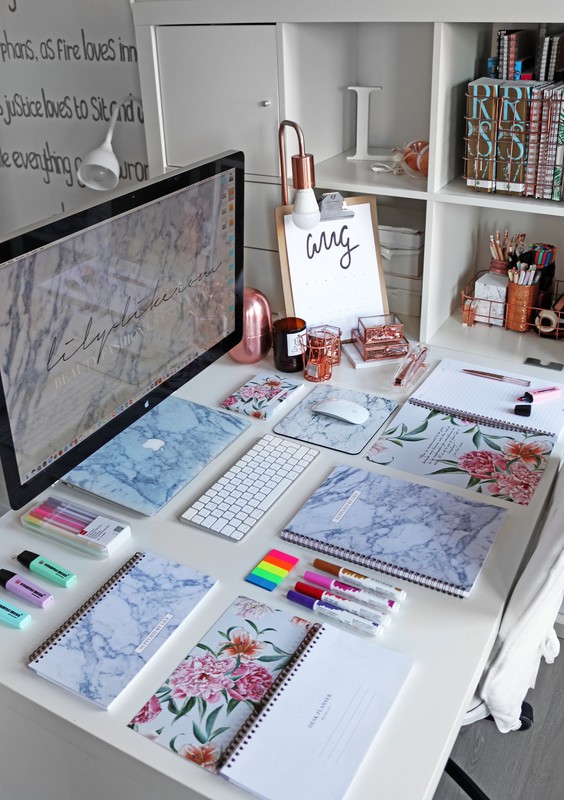 I know a lot of you are not that excited to go back to (law) school/uni/college, but being well-prepared will make your new academic year way easier. 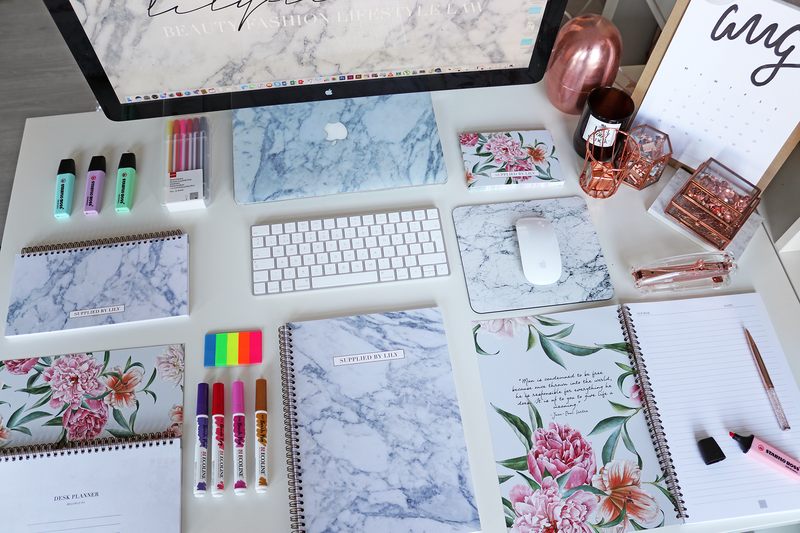 That's why I wanted to create a Back To School/University Supplies & Stationery Guide, where I will be sharing my must have items for killing your courses this year. Hope you enjoy! I hope you enjoyed this video! I definitely love showing you all my new items for the upcoming school year. Nevertheless, I am aware of the fact that back to school shopping can be overwhelming. That's why I also created a back to school supplies and stationery guide for you guys, so you know what you have to shop for! Just open this blogpost on your phone and use it as your checklist whenever you're on a back to school shopping spree! PENS - Back to school season means that you need to stock up on new writing gear. I have a confession to make: I'm addicted to cute pens. 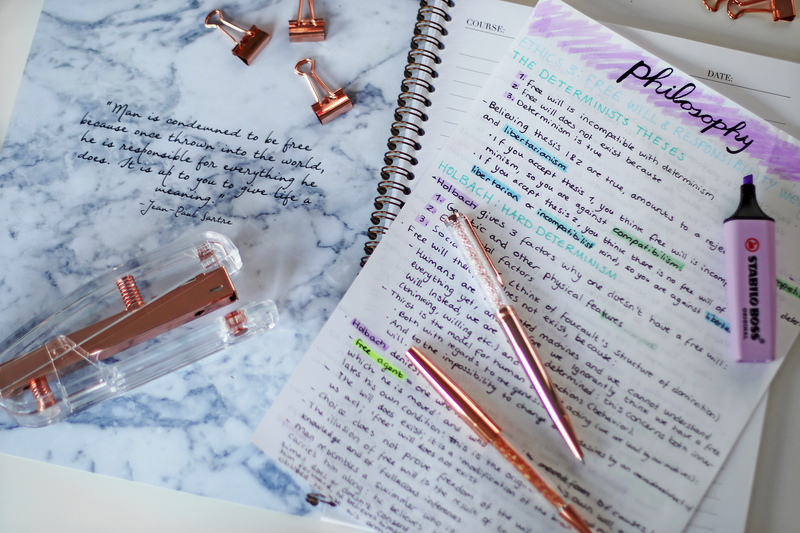 I just love writing my notes or making my planning while using a pretty pen. However, it's quite hard to find them actually. 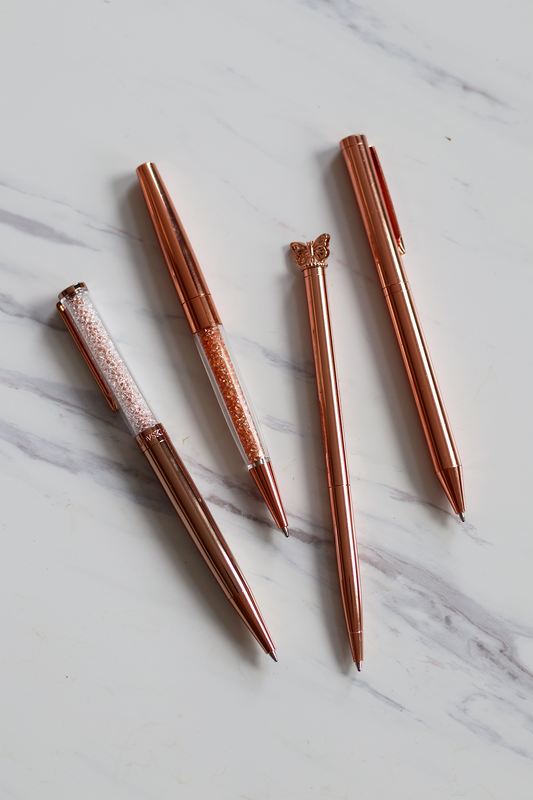 That's why I decided to splurge this year and get the Swarovski rose gold pen (shop here). If you're looking for a cheaper alternative, Etsy has very good options too (shop here for a dupe and here for one without crystals). If you're more into kawaii pens, Ebay is the way to go. You can find most pens there for 99 cents and free shipping. The shipping takes ages though, so be prepared to wait for 2 months. You can find these cute cat pens here. MARKERS - Another writing essential are fineliners and highlighters. I like to use a color coding technique when it comes to studying and taking notes, so I'm always on the lookout for new shades. My favorites are the highligher and fineliner sets from Hema, because they come with a lot of shades ánd handy packaging. 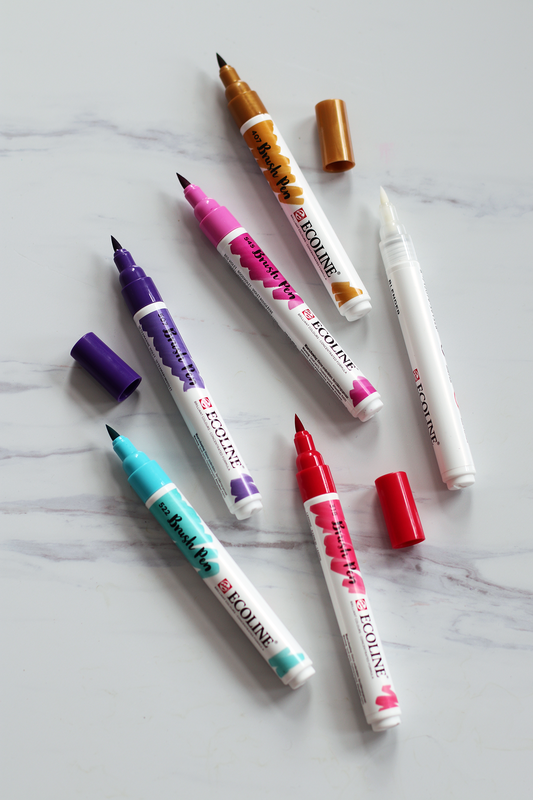 You can find the fineliners here and the highlighters here. I also advice getting a mini pack of highlighters for during lectures. I hate carrying lots of heavy stuff with me (law student problems...), so mini size anything is a big plus for me. 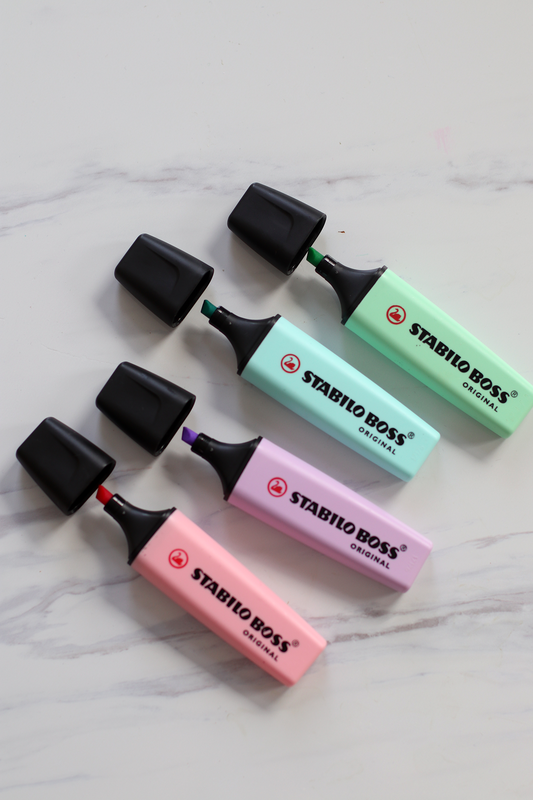 If you're into very aesthetically pleasing markers, you should definitely try out the pastel marker line from Stabilo (shop here). I have them in 4 colors, but I can't wait to get all 6 of them! BRUSH PENS - This writing essential is quite personal, but I love making my notes and summaries aesthetically pleasing by using handlettering techniques. To handletter, you need to use different types of brush pens. I really like the brush pens from Ecoline (shop here), and also the calligraphy pens by Pigma (shop here). NOTEBOOKS - Another must have for your back to school shopping guide are notebooks. I usually use 4 notebooks each semester, so I buy around 8 notebooks for each new school year. This year I'm going to use the Supplied by Lily Spiral Notebooks from my own stationery line. They come in the Luxurious Marble print (shop here) and the Luxurious Floral print (shop here). What I love about these notebooks is the fact that each page has space to write 'course', 'date', and the page number. This way you can organize your notes way easier! PLANNER - One of the most important things you will need for an organized and successful school year is a planner. 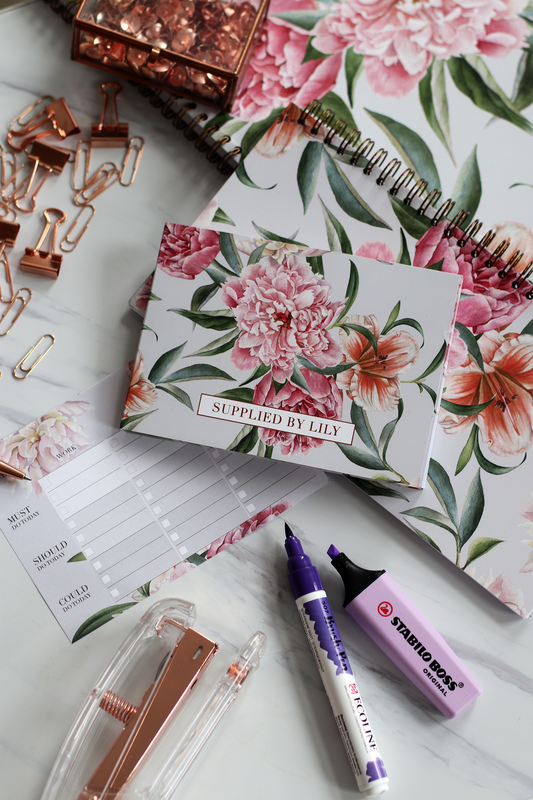 I honestly can't live without my Supplied by Lily Desk Planner. Inside, you will find a yearly, semester, monthly and weekly overview, which is perfect for any student. It also has different types of to do lists, achievement plans and much more, so you can start your new school year well prepared. It comes in the matching Luxurious Marble print (shop here) and the Luxurious Floral print (shop here). TO DO - I am a big lover of making to do lists. Sometimes a planner just won't cut it, which means you need to divide your tasks in smaller 'chunks'. I love using my Supplied by Lily To Do list to achieve taht, because it gives me the option to organize my tasks when it comes to their subject and priority. This way I have a mini planning and to do list in one! You can find the Supplied by Lily To Do List here. OFFICE SUPPLIES - Last, but not least I also wanted to talk about a couple of office supplies that are nice to add to your shopping list. First of all, for all my law students, I really recommend purchasing some different bookmarks or sticky notes. I got two different ones from Hema that you can find here. Also, things like a pencil sharpener, preferably in rose gold, is good to have (shop here). 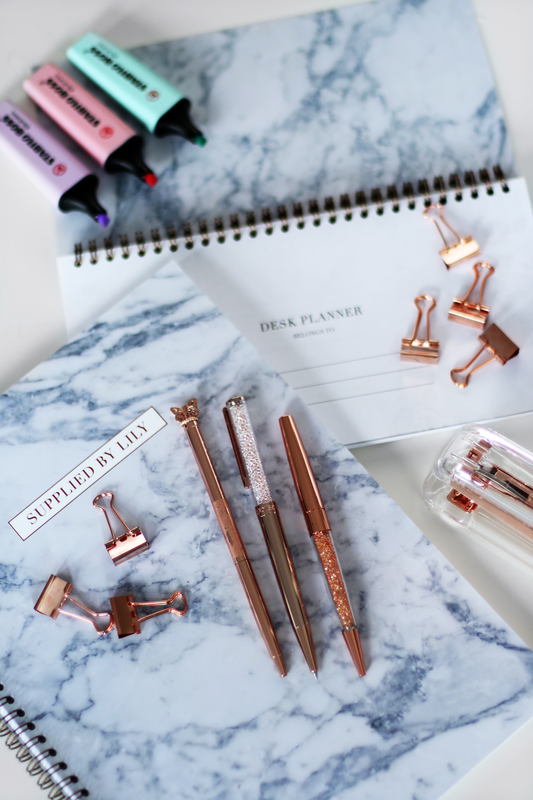 If you want to add some accessories to your desk that are practical and pretty, this rose gold stapler is also a very good option for you! WHAT'S YOUR BACK TO SCHOOL/UNIVERSITY SUPPLIES ESSENTIAL? 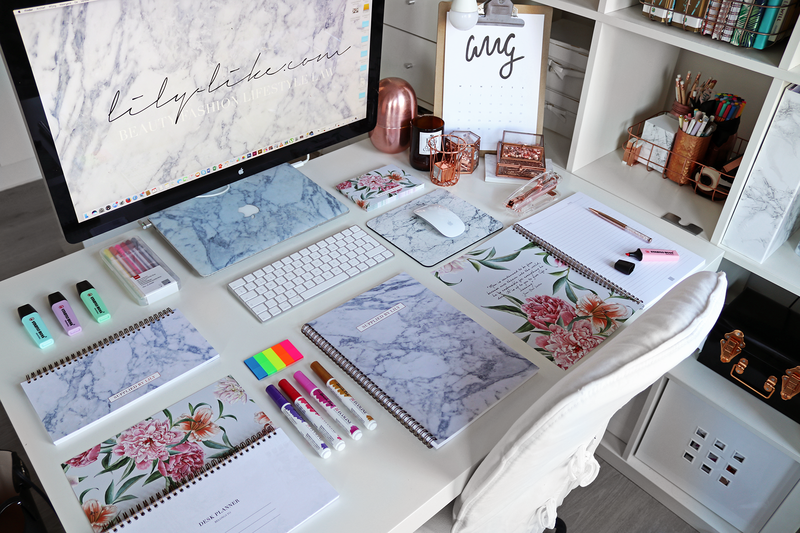 I just found your channel and I think you are really adorable.Also I think your apartment is so beautiful and tumblr.I freaking love your office area with the marble agenda,backrounds and so on.I am German so school is starting soon and you inspire me how I want to become and how I want get through my school life. I have entered the giveaway. I subscribed to your youtube account and followed all the instagram. But can’t repost or like the picture on instagram, it states that it no longer exists. But I love your website. I’m a law student too! I really love your page your study habits are amazing, really motivational and legitimate goals. I was also wondering where you got your laptop desktop wallpaper. I love your website and I’m an aspiring law student. I remember collecting so many pens when I was studying, ugh sometimes I miss college. 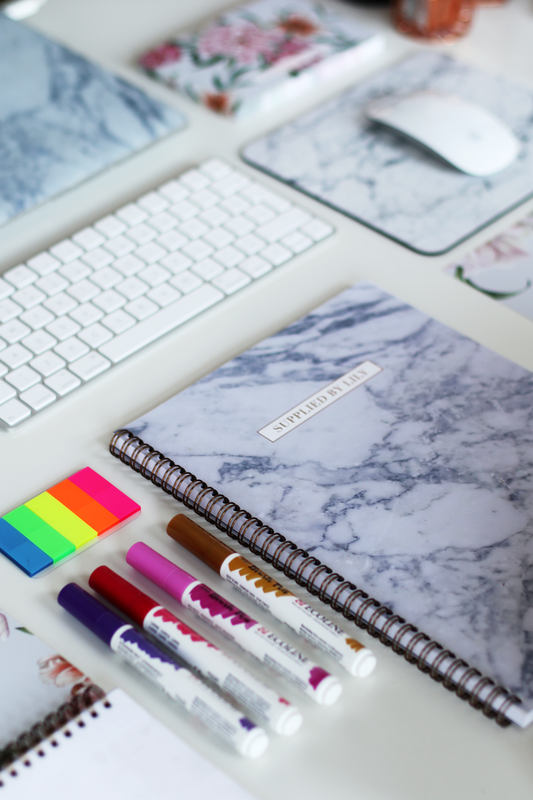 Your desk looks great! Can you buy some of these things or is it just your things? The shopping links are literally in the article lol.